On October 8, 1980, Republican presidential candidate Ronald Reagan came to Wheaton College at the invitation of the campus Republicans. His visit came after receiving his party’s nomination during the fall campaign season and was covered in the Record student newspaper. Edman Chapel was filled early in the afternoon by students and area residents eager to see and hear the former California governor. 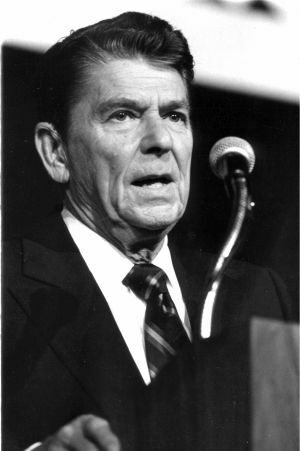 State and county political figures, including Illinois governor James Thompson, filled the platform and spoke at some length when Reagan failed to appear at the scheduled time. A busy day of campaigning, which had begun in Youngstown, Ohio, delayed his arrival by one hour. The governor’s whistle-stop visit was accompanied by numerous religious references within the first few sentences of his speech. He spoke of deliverance, rebirth and C.S. Lewis–words that were well-chosen and that resonated with the audience. Candidate Reagan’s address centered not on war or the proliferation of nuclear arms, but on education. Only if the people closest to the problems of education — teachers, parents, school boards, and boards of governors — are allowed to make the basic educational decisions, will the quality of education improve. He praised Wheaton as a school with a mission. Reagan promised, if elected, to form a task force to analyze federal educational programs. He expressed support for tuition tax credits for parents sending children to non-public schools. What we want is so simple, so elementary. All we want is to live in freedom and in peace, to see to it that our nation’s legitimate interests are protected and promoted. We want to worship God in our own way, lead our own lives, take care of our families and live in our own style, in our own community, without hurting anyone or anyone hurting us…We want the kind of personal security human beings can reasonably expect in a system of economic freedom and democratic self-government. At the conclusion of his address Reagan laughed when presented with a stuffed mascot-sized replica of Perry Mastodon by Brad Bright, president of the campus Republicans. Obligated to hurry off to his next campaign stop, the visitor had no opportunity to tour the campus or chat informally with students. Reagan would defeat Southern Baptist Jimmy Carter the following month in the general election. President Carter himself came to campus twelve years later to give the Pfund Lecture.